Renae here with an other weather-inappropriate recipe. Actually, that’s not true. Although a nice hot bowl of soup is probably not the most tempting-sounding dish when it’s 100-freaking-degrees out, based on its ingredients – garlic scapes, fresh garlic, new potatoes – this soup is kind of late-spring-to-the-max. One year it’s impossible to find garlic scapes anywhere but the Korean grocery store (where they go by the name “garlic stems”), the next, all the farmers have them at the market, for week after week! My farmers market had fresh garlic – normal cloves of garlic that hadn’t yet been dried – which is what I used. It doesn’t keep as long as your standard dried head of garlic, but it’s an interesting change of pace. I can’t decide if it tastes more or less pungent than the freshest dried garlic, although it’s definitely more flavorful than garlic that has been around too long. It really just seems to taste “fresher” (some help I am, right?). The big difference is just that instead of peeling off thin, dry, papery layers to get to each clove, you peel off thicker, wetter layers until you get to the point you can squeeze each bulb out. You can use whatever kind of garlic strikes your fancy, however. Heat some oil in a Dutch oven over medium heat. Add the onion and cook until soft, then add the minced or pressed garlic and the garlic scapes and cook for another minute or two. If necessary and desired, you can deglaze the pot with a bit of white wine. Then add the potatoes, broth, and soy sauce. Bring to a boil, cover, reduce heat, and simmer for 30 minutes or until the potatoes are soft. Puree with an immersion blender. (Or let it cool a bit and puree in small batches in a regular blender. I, however, don’t trust hot liquids in blenders.) Adjust seasonings with salt and pepper. If desired, top with some stuff. 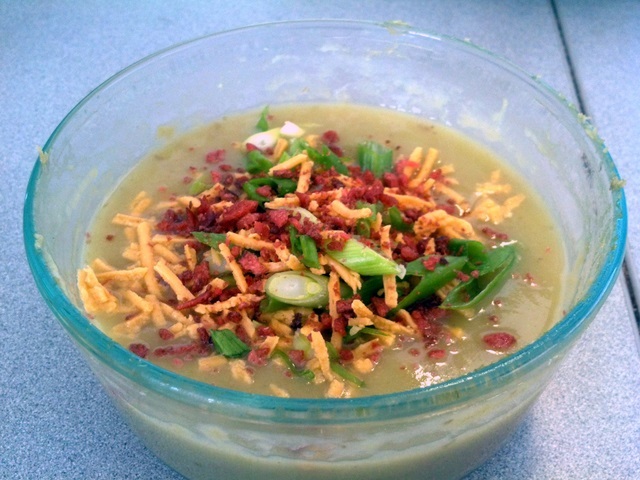 Pictured are Daiya cheddar “cheese” shreds, scallions, and vegan bacon bits. Most of you probably can’t tell because I’ve never put nearly the amount of effort I should be into taking my food pictures, but today’s food pictures are even lower quality than usual. That’s because I took them at work with my phone. I devoured the soup too quickly when I made it for dinner Tuesday night to take a picture, so I took a picture of the leftovers when I had them for lunch at work today. The sad thing is I had my real camera with me – it generally goes wherever I go – but when I went to take the picture, I realized I’d left the battery in the charger at home. AND I’d left all the spare batteries in my other camera bag. I’ll use this as an opportunity to proselytize about taking time out for lunch at work, though. I know you aren’t supposed to eat at your desk because it’s good to get up, get out, and enjoy a change of scenery somewhere you can’t be tempted to do work while you eat, but we’re a fairly small business without a cafeteria or other appropriate eating place. I could have gone outside, but did I mention it’s 100 degrees outside? Lugging a bowl of hot soup down 8 flights of stairs to eat it under the blazing sun just didn’t seem practical. There is a small table in the kitchen, but eating there just invites everyone who uses the kitchen to talk to you and I don’t like talking to people during my lunch. I like eating my lunch during my lunch. And reading books. So I do eat at my desk, but I log out of the computer, stick my nose in a book, and glare at anyone that happens to drop by to ask me something until they back off and agree to come back later. And I’m a huge fan of making my lunches as nice as I can as a little treat for myself. I usually eat leftovers, so sometimes my lunch is just not that pretty, but I try to dress them up when I can. Today right after lunch I had to do a demo for an application I wrote and I hate, hate, hate, hate, HATE public speaking. However, having a pleasant lunch with a nicely-topped bowl of soup (and, importantly, reading a book instead of freaking out) right before the demo chilled me out and guess what? I didn’t even have one of my usual public-speaking dry-throat choking spells! In photography news, the other week I went to Red Rock Wilderness Overlook for the first time. I knew it was a small park but I was thinking maybe because it isn’t very popular, I’d run into more wildlife. I also thought it would have nice views of the Potomac. Unfortunately, I’ve been spoiled by the Potomac view at Great Falls so my expectations were set way too high. It was an easy fraction of a mile to the overlook, but all it overlooked was a very still, very brown, rather boring Potomac, partially obscured by a tall fence with lots of “NO ENTRY BEYOND THIS POINT” signs. No rushing falls, no rapids, no interesting rocks, no hawks flying overhead. No crowds of people, sure (mine was the only car in the parking lot), but also no signs of wildlife other than a squirrel or two. It was kind of boring. What there were, however, were a few agreeable damselflies, who make much better photography sitters than dragonflies. The full size versions of these are much better so I’ve made these two pictures clickable if you are interested. A slightly different variety. Their face are like robots! They’re fascinating. In real life, this damselfly was about an inch and a half from end to end. They are very tiny; these macro shots exaggerate their size. I think that’s why their little robot faces are so amazing to me – they are little bigger than the head of a pin. Other than friendly damselflies, the one interesting thing about Red Rock is the ruins that surround the parking lot. They were part of the farm that used to be there 150 years ago. What I assume is the original farmhouse is also still there but it’s not in ruins and in fact is inhabited and private property. So you sort of have to walk through these people’s back yard to get to the trails. This, I think, was the well house. The ice house is located away from the other ruins and is instead behind the farmhouse. There was a man working in his garden behind the farmhouse while I was there, which made me feel a little tresspass-y, even though I wasn’t, but I didn’t feel so weird I was unable to grab a picture of his house because I love old houses. First of all, Happy Bloomsday! It’s mid June and although so far weather on the East Coast has been cycling from unbearably hot (Memorial Day weekend) and super-nice (this week), I decided the other night that I was making a stew for dinner. 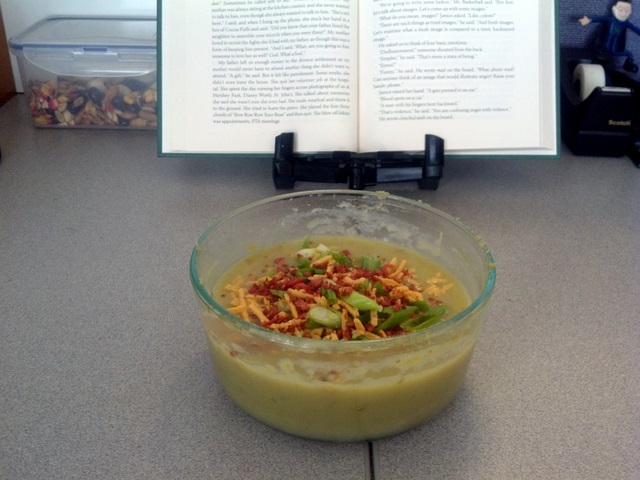 Honestly, it was a pretty wintry dish, but I eat soup year-round and I won’t apologize for it! Also, I had some sauerkraut that needed to be eaten. And I missed the farmers market last weekend so I didn’t have many vegetables and was totally lacking in inspiration. I suppose you could say my lack of inspiration inspired this stew. Heat some oil in a Dutch oven over medium high heat. If you are using regular onions cook them for a few minutes. (If you are using pearl onions, skip this step and just add them with the other vegetables.) Add whatever “beef” you are using and brown it, then add the garlic and fry for a minute or so. Then add the rest of the vegetables and fry for a minute or two. Add the tomatoes and use their juices to deglaze the pot if necessary. Add the “beef” broth, sauerkraut, and thyme. Bring to a boil, reduce heat, cover, and simmer for about half an hour or until the carrots and potatoes are soft. Season to taste with salt and pepper. Guess what we haven’t had in a while? A raccoon update! We have, I think, 27 babies right now, and most of them are very healthy; several have overcome great hardships like being burned in a chimney and being chomped by some unknown predator. What we need is help! We really don’t have enough volunteers. Anyone in Northern Virginia interested in cleaning (or building) raccoon cages….and feeding little faces like this?! Meet Tobias. He’s a real sweetie and one of my favorites. Remember Emmy, the awesome surrogate mother who is raising five of our babies for us? Here she is during Memorial Day weekend trying to beat the heat by hiding under a deck. You never know where you might find a raccoon at the sanctuary! She was probably a lot cooler than me. I actually have a couple of food posts lined up – I swear. In fact, I was going to do one tonight and combine it with my final vacation post, but the problem is I really loved Nice and therefore have a lot of pictures. The prospective food post will give me something to do this weekend – when I’m not celebrating Bloomsday! I planned nothing for Nice. I figured we’d just see what happened once we arrived. Of course, I also assumed we’d have internet access in our hotel which would help in that regard, but that turned out to be a lie. So the first day or two, we just did a lot of walking around and taking in the sights. I liked this plaza. It inexplicably contains a statue that from the back, from far away, looks like a giant sea monkey. Up close its a naked man wearing a crown of horses, which I think is actually more bizarre than the sea monkey theory I first put forth. There are also these tall poles with more naked – but horse-crownless – men kneeling on them. I was entranced by them. At night they lit up different, cycling colors! One night as we were wandering we came across this street artist who does these pretty amazing works with spray paint and the occasional blow torch. It takes him about 10-15 minutes to complete one. They mostly depict ethereal forest scenes or other worlds. He’s like the Bob Ross (aka God) of spray paint. Mark had in fact seen videos of his work before and thought it was cool, so it’s pretty awesome we just ran into him – Mark hadn’t even known he was French. It was fascinating to watch and I’m sorry we didn’t buy one of the paintings. Not only are there bizarrely wonderful statues and crazy-cool street artists, but there’s also a little something called the Mediterranean Sea, which I had never seen before! So blue, so painfully gorgeous. So different than the opaque greenish-brown Atlantic Ocean. Mark managed to connect to the internet long enough to learn about Le Château, which is not a castle (any longer) but is a park atop a hill, accessible via many stairs or, for cheaters, a secret free elevator. There was apparently a huge Jewish mafia wedding reception going on in the park when we were there. Although a large part of the open space was roped off and patrolled by slightly menacing men in black, it was a charming park with beautiful views. The park is quite large but somehow we managed to run into Brad and April while we were there, completely unplanned. One day we found ourselves in Monaco, which was preparing for the Grand Prix, which was to take place that weekend. That’s a Ferrari going under the Grand Prix sign. My father is a Formula One enthusiast and I therefore tried to work up some vicarious excitement, but I have to report that Monaco wasn’t all that interesting. I mean, outside of being located in what is my new favorite part of the world, the Mediterranean. The best day of the entire trip was the result of Brad’s planning. (If you’ve actually read any of these vacation posts, by now you’ll know I’m not a big planner.) Brad had learned about the nearby village of Èze, and that we could take a 20-minute bus ride to the top of its renowned hill, explore the medieval ruins, then hike down the Chemin de Nietzsche (Nietzsche’s path): crumbling, rocky steps that wind through woods down the hill, depositing you at the stop for a different bus back to Nice. Èze was magical. After stepping off the bus near the tourism bureau, you begin walking up lazy sets of stairs that meander through the remains of the old village, now filled with artists’ galleries, boutiques, cafes, and a couple of what-must-be-totally-fabulous hotels. After eating lunch and falling in love with the village, it was time to begin our journey down the hill. Nietzsche’s path is so called because Nietzsche walked it several times when staying in Nice and found inspiration in it while writing Ecce Homo. At the top of the path, you can sidestep to admire Èze on the hilltop. It’s nearly impossible to see in the small version of this photo, but the large garden of one of the hotels contains numerous animal sculptures (as well as a human-sized chess set), which dot the terrain. Brad had read that it should take about 45 minutes to walk down the path. It took us about two hours. I will admit up front that I was at least 95% responsible for the extra time. I’m afraid I amble more than hike and I photograph EVERYTHING. But surely you’ll understand why; it was probably the most breathtaking place I’d ever been. Seriously – I want to move to the French Riviera. I felt right there. I liked Paris, I really did, loved it even. But the Cote d’Azur? I can picture myself living there until the end of my life (something I’ve never said about any location), the long days (boy, the days are long there) mingling into each other sun-drenched day after sea-dazzling day. Yes. Yes I will Yes. After shooting these images, I rushed inside to grab my tripod and set it up in case I wasn’t holding the big lens steady enough, but by the time I got the camera on the tripod, the clouds had rolled in and I never saw the sun again. Fortunately, the pictures I got turned out! Was anyone else able to watch the transit?